is a tone on tone coloring treatment formulated cream made from herbal extracts and rice bran oil. 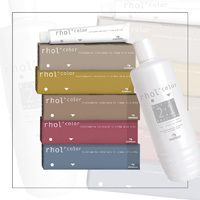 Ideal for those who do not want to change their natural color. Its formulation has been designed to not alter the structure of the hair, in addition to ensuring the protection even improving it. Color, restructures and eliminates 6/8 washes.